Posted on June 11, 2014 by revivewa	in News and tagged breaking of the ties. Rev Ian Pearse and Rev Marie Wilson breaking the ties. 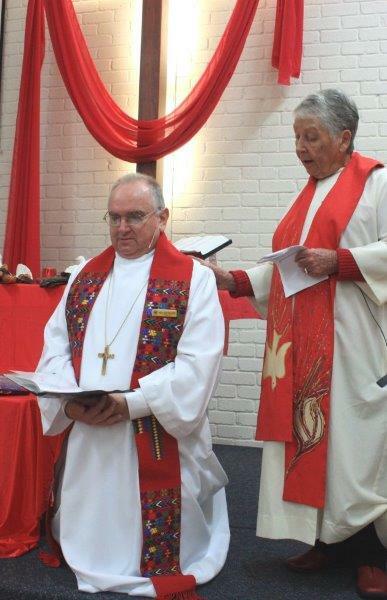 On Sunday 8 June the Uniting Church in Australia congregation in Mandurah held a special Breaking of the Ties service as they said farewell to Rev Ian Pearse. Ian has accepted a call to Bacchus Marsh in Victoria. Ian and his wife Bev have been in placement in Mandurah for 5 years serving the community. Ian was a member of the Interagency Group who organise the annual Christmas Hamper distribution, Youthcare who support the Chaplains in schools, Peel Homelessness Night shelter group and Rotary. He supported the Mandurah Rainbow lunches providing a range of care for those who attended. Ian’s Ministry also included negotiations around the new development in Mandurah of a Not for Profit accommodation building on the church site. This has been a long and involved process which was helped along by Ian’s negotiation with the wider Uniting Church in Perth and local community groups. The local congregation wish Ian and Bev a safe move to Victoria and a time of blessings in their new Parish.